…just as it was predictable there would be – and just as we said, the endorsement was a stupid and classless idea in the first place that Gov. John Bel Edwards should have rejected. In case you missed this yesterday, there was a $1,000-a-plate breakfast fundraiser on LSU’s campus for Edwards’ re-election campaign Thursday morning, and Orgeron, the LSU head football coach, showed up to shower the governor with praise and call him a “championship quarterback” for the state worthy of re-election. The whole thing was captured on video, which also wasn’t smart and shouldn’t have been done – once it’s on video it’s going to become a public thing and the backlash is inevitable. Kennedy’s position, that governor’s races are divisive things and LSU shouldn’t be thrown into the fray, is undoubtedly going to fan the fire of the Orgeron endorsement. He didn’t attack the coach much, reserving more of his ire for LSU president F. King Alexander and for Edwards for letting it happen. But Kennedy wasn’t alone in expressing opposition to the endorsement. Republican Rep. Ralph Abraham, currently polling as Edwards’ likely runoff opponent in the gubernatorial election, backed Kennedy’s position. “Let’s be real here – John Bel is his boss,” he said. “Next thing you know he will be trying to lead the band out like Huey Long. A full-throated endorsement of John Bel Edwards by a state employee, Ed Orgeron, who, as the head coach of LSU, also happens to be by far Louisiana’s highest paid employee? Really? This is a bad look even if it is not an outright legal or ethical violation (which itself needs to be investigated, by the way), especially since Coach Orgeron happens to have just received a raise and a contract extension on March 20. The LSU Board of Supervisors which granted the raise happens to have been appointed by, you guessed it, John Bel Edwards! This is too much happenstance for our tastes, and kudos to Senator Kennedy for calling out the Governor for this tawdry episode in Louisiana politics. But as bad as this looks, the fact that it happened at all says more about John Bel Edwards’ lack of any sense of propriety and his broken ethical compass than the mere facts of the matter. Make no mistake- this is political thuggery worthy of the worst years of the Huey Long era. 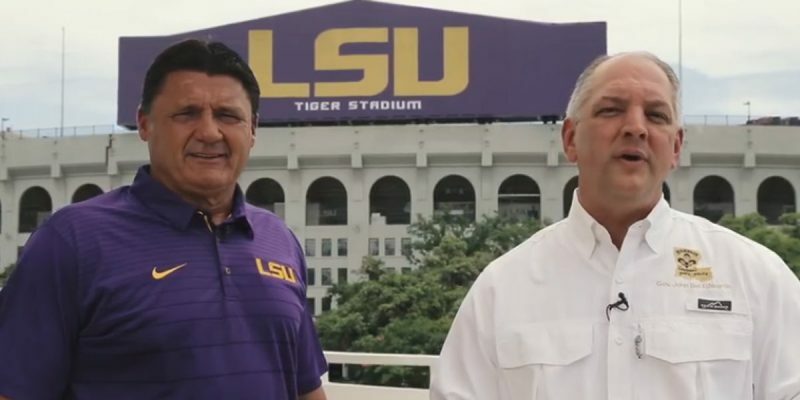 We suspect that most LSU fans do not attend football games for political theater and many will be offended outright by the head coach’s insertion of politics into their favorite sport. It is still early days, but the Governor is off to an 0 and 1 political season. The statement is an outright failure on several levels. First, you don’t get to draft Orgeron to endorse your candidate and then attack others for criticizing that move – nobody is going to allow you that kind of have-your-cake-and-eat-it-too leeway. The entire point of the criticism of Edwards orchestrating Orgeron’s endorsement at a fundraiser he’s throwing on LSU’s campus is that it invites this kind of opposition and taints the state’s flagship university in the process, and while Eric Holl – who attended LSU while Bobby Jindal was governor before moving on to positions as a campaign functionary for Terry McAuliffe, Mark Warner and Roy Cooper in Virginia and North Carolina – might not think this is an issue of substance a whole lot of others will disagree with him. Which is the whole point. LSU is supposed to be protected from partisan politics, because LSU is the state’s flagship university and it’s supposed to be an institution people of all walks of life and all political persuasions can rally behind. Once that’s gone you’ll have a whole lot less people giving a damn what happens to LSU, and whether that’s right or wrong when it happens it’s going to be John Bel Edwards’ fault as well as the people at LSU – including Alexander and Orgeron and the Board of Supervisors members mostly at this point appointed by Edwards – who let it happen. And no, it’s not about Ed Orgeron’s First Amendment right to endorse who he wants. Nobody is attempting to deny him that, nor is Kennedy or anyone else out to get Orgeron for doing it. It’s not whether he has to be silenced, it’s whether his insertion into a divisive gubernatorial race damages the institution he works for. And the fact that within a day a Senator, a Congressman and a state party chairman are putting out public statements denouncing the endorsement, which is something everybody in the state could see coming from a mile away, proves what an unwise choice this was. Gurvich has this right. Edwards didn’t win with this endorsement. It counts as an offsides penalty wiping out a play. Bad form, and likely a good bit of damage done both to the governor and to LSU. Previous Article ‘Cornyn War Room:’ Democrat Master Strategy Or Out-of-state Fundraising Pitch?